The battle for Kiev’s Independence Square has reignited as rioters clash with security forces amid sniper fire. 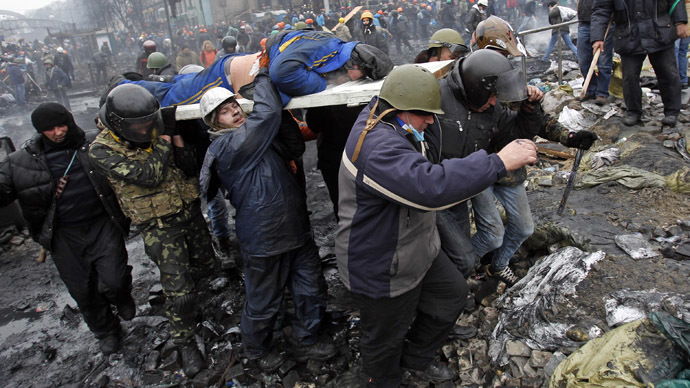 The death toll has increased to 35, the Ukrainian Health Ministry confirmed. It has also announced that 505 people have been injured in the turmoil, with around 300 of those admitted to hospital. Rioters have reached the Rada building (the country's parliament), while the police have been pushed back into Mariinsky park nearby. An emergency evacuation has been declared and parliament members and employees are leaving the building. Protesters hurled rocks and Molotov cocktails at the police on Thursday morning as violence broke out once again in spite of the day of mourning that had been declared as a mark of respect for the 35 people who have died in the unrest. Ambulances have been sent to Maidan and video footage shows several people carried away on stretchers. Police are throwing tear gas grenades at protesters, according to Unian news agency. Protesters pushed security forces off Independence Square and seized Oktyabrsky Palace - a major concert hall in the Ukrainian capital - and Hotel Ukraine. Gunfire can be heard throughout the Ukrainian capital. Furthermore, a dozen police officers have reportedly been captured by demonstrators on Independence Square. The Interior Ministry of Ukraine said that at least 23 police officers had been injured by sniper fire on Independence Square. The protesters are “openly using fire arms against the Berkut [Special Forces],” wrote the Interior Ministry in a statement. “The injured are currently receiving emergency medical help,” said the Interior Ministry. Police say that the sniper fire originated from the roof of Kiev’s Conservatory and targeted officers. The Ukrainian opposition claims that protesters were also caught in the gunfire. “I think the opposition has crossed the line. I think the policy of negotiations has exhausted itself,” said the deputy head of the Party of Regions, Oleg Tsarev, in parliament. Ukrainian President Victor Yanukovich met with opposition leaders on Wednesday evening where a temporary truce was agreed to mourn the victims of the mass unrest. Hardline opposition group Right Sector rejected the truce and urged its followers to continue the offensive. In response to the continuing violence in Ukraine, the international community has threatened sanctions if both sides do not return to the negotiation table. Foreign Ministers from Poland, France and Germany were scheduled to meet with Yanukovich and opposition leaders on Thursday, but left the city unexpectedly for security reasons. “We’ll be monitoring very carefully the situation, recognizing that, along with our European partners and the international community, there will be consequences if people step over the line,” Obama said.